India that is Bharat is like a Banyan tree stretching over the entire sub-continent of South-Asia with well-developed supporting stems in and around, to trace the original one in respect of its culture and heritage. In this part of our motherland, Warangal is largest city of state Telangana. Located at a distance of 148 kms from the state capital of Telangana it has so far creditably passed through from pre-historic times to the present days. It is a historical city that was earlier known as 'Orugallu' or 'Ekashila Nagaram'. This region has provided a strong base foundation of Satavahana and Chalukya emperors and was ruled by Kakatiya kings during 1001-1323 AD. During this period the region was acknowledged as center for cultural development, learning, Art and Architecture made a significant progress. 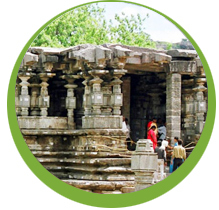 The real beauties of temples located in this area discover the age of old capital of Kakatiya Kingdom. The rich culture and heritage is still maintained till today. The historical monuments of this region with excellent architectural styles have been attracting a wide variety of people from various parts of the world. It is an important cultural center like, 'Rajamahendravaram', which gave birth to 'Adikavi Nannaya', it could claim equal status as the great poet Pothana the author of 'Srimad Bhagavatam', one of the finest creations in Classical Telugu, born in this place. The city was mute witness to rise and fall of many a Kingdom with a rich historic past. 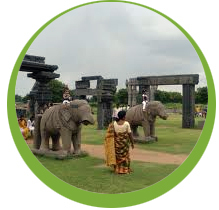 The twin cities of Warangal and Hanamkonda are known tourist places with various site seeing places like Warangal Fort, Temple Hill of Bhadrakali, the vast and dense forests of Eturnagaram and Parkal, Lakes, Enchanting Gardens, Wide roads with historical structures, Animal Sanctuaries, Zoological Park, Science Museums, Planetarium etc.